(c) 2010, The Bertrand Russell Peace Foundation Ltd. This collection of six lectures are popularly known as Reith Lectures (which were delivered in the autumn and early winter of 1949, to honor John Reith, the founding Director of BBC who was Proud, Imperious, and vindictive autocratic administrator and formidable personality who succeeded brilliantly both in bruising the sensibilities of subordinates and overseers alike and in creating one of Britain's most admired and durable institutions) were delivered by Bertrand Russell. 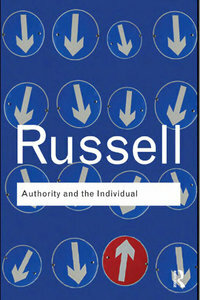 Authority (which is a reflection of state power) and the Individual (which reflects human freedom) as a book includes the lectures on Social Cohesion and Human Nature, Social Cohesion and Government, The Role of Individuality, The Conflict of Technique and Human Nature, Control and Initiative - their Respective Spheres and Individual and Social Ethics. The first essay (lecture) on social cohesion and human nature deliberates on different aspects of commonalities in the beings (animals and human) as well their distinctions. Russell gives a very good example of Bees and Ants who have cooperation and unity of a group as important instincts though they are 'never tempted to anti-social actions and never deviate from devotion to the nest or the hive'. However they do not dream like the human beings. It is the social group called Family which necessitates the division of labor as the men hunted while the women stayed at home. Second lecture entitled Social Cohesion and Government discusses the responsibility and role of government in order to build cohesion in societies. It also establishes the fact that the relationship between societies and the government has to be nurtured for better policy to rule. Different kinds of governments ruling in different parts of the world from Old Stone Age to the modern ones are exemplified in order to strengthen the argument as to authority, obedience, enforcement, liberty, freedom, religion, etc. Russell mentions - Governments, from the earliest times at which it existed, has had two functions, one negative and one positive. Its negative function has been to prevent private violence, to protect life and property, to enact criminal law and secure its enforcements and positive functions of government at most times have been mainly confined to war: if an enemy could be conquered and his territory acquired, everybody in the victorious nation profited in a greater or less degree. He further states that the ambit of positive functions is broadened now as the governments have to provide education (consisting not only of the acquisition of scholastic attainments, but also of the instilling of certain loyalties and certain beliefs), and encouraging industrial enterprises. The examples of the government in USA, Britain, Egypt, Sweden, India, China are sketched very lucidly. Third lecture entitled the role of individuality basically deals with the impluses and desires of individuals for good as well as for evil. The differences between individual's behaviour as the change happen with their respective roles have been critically discussed. The role of court poets, artists and their contribution towards the expansion of glory of their patrons is well placed. We have been witnessing such glorifications all through ages and the present time is no exception. This is what makes his lecture still very relevant and provides a questioning eye towards such self sponsored praises. Religion, moral progress (innovation), rise of men of science, community feeling and their role in building the base for individual behaviour is just marvellous. Russell puts it - The great men who stand out in history have been partly benefactors of mankind and partly quite the reverse. Some, like the great religious and moral innovators, have done what lay in their power to make men less cruel towards each other, and less limited in their sympathies; some, like the men of science, have given us a knowledge and understanding of natural processes which, however it may be misused, must be regarded as in itself a splendid thing...I cannot think of anything that mankind has gained by the existence of Jenghis Khan. I do not know what good came of Robespierre...I see no reason to be grateful to Lenin. But all these men, good and bad alike, had a quality which I should not wish to see disappear from the world. The lecture ends with a very hopeful note on the role of modern organizations and institutions in allowing/disallowing the individuals to play their constructive role. When this lecture was delivered, around same time Ford was leading car company and Fordism was in currency so far as management practices are concerned which was also driven by the view as reflected by Russell (the purpose of the workers is to earn wages). Primarily for survival it seems correct but beyond that it is not just that. Elton Mayo's work (Howthorne Experiment) defends an argument that work is a group activity and workers are driven by many other factors as well. Herzberg's Hygiene theory concludes on satisfiers and dissatisfiers and apart from Salary there are other factors which play an important role. Further beyond management, Easterlin Paradox also defends that the role of money ends till the basic needs are fulfilled and beyond that there are other factors which become more important. So the point is that at present can we continue with a framework of mindset that the workers are working for wages only. I feel that would certainly be a folly. This lecture questions the basic premise of all the problems of today's world. He questions the very concept of money and monetization which has created a great divide. The conflict between management (capital) and the worker (labor) and the role of the government to resolve such conflict though he warns - it would be unduly optimistic to expect that governments, even if democratic, will always do what is best in public interest. His another warning - Men can be stimulated by hope or driven by fear, but the hope and the fear must be vivid and immediate if they are to be effective without producing weariness. His views on competition, democracy, role of government, austerity, power, politics, industrial revolution are worth reading and thinking which are highly contextual and lead to a thinking of well-being. In continuation, fifth lecture is entitled control and initiative: their respective spheres. The aim of government as he suggests should be security, justice and conservation apart from taking care of institutions which produce scientific research. The spirit of the whole chapter lies in the fact that there cannot be fruitful initiative without government, but there can be government without initiative. The role of government is well explained and the problems in the absence of government are illustrated as well. The scope of initiatives and actions as inspired by the governments are subject to control so that the governance becomes better. These ideal roles of states are to be subject to public scrutiny through appropriate institutions. The issues related to the remuneration, industrial democracy and institutional control are well spelt in the lecture keeping in mind the differences between nations as material goods are more a matter of possession than goods that are mental. The last lecture in the book entitled individual and social ethics concentrates on two points – first to repeat briefly the conclusions reached in earlier lectures; and second, to relate social and political doctrines to the individual ethics by which a man should guide his personal life. Security and justice as mentioned as the function of the government in the earlier lecture, require centralized governmental control. He suggests a supra body called world government. This whole lecture provides guidelines for the functioning of state keeping in mind the individual initiatives and basic human ethics. His suggestions as to governance of railways and control of scientific research are worth reading. The religious texts like the Old Testament are quoted for maintaining human/social ethics. As I said in Lecture III, prophets, mystics, poets, scientific discoverers, are men whose lives are dominated by a vision; they are essentially solitary men. When their dominant impulse is strong, they feel that they cannot obey authority if it runs counter to what they profoundly believe to be good. The assertions by such individuals and bodies in order to follow ethics while being loyal to their masters are great examples which as the part of state are still relevant. Individuals play their roles according to their loyalties. Men who boast of being what is called ’practical’ are for the most part exclusively preoccupied with means. But there is only one-half of wisdom. In the present world it might sound very conservative but in the name of practicality and professionalism the spirit gets lost and the drive to create new knowledge, the understanding of love and friendship, the feeling of the smell of blooming flowers, the glory, etc etc, all fall flat. Love of power still leads to vast tyrannies, or to mere obstruction when its grosser forms are impossible. And fear – deep, scarcely conscious fear – is still the dominant motive in very many lives. He guides towards the end of the lecture – self control has always been a watchword of the moralists, but in the past it has been a control without understanding. These lectures are still very relevant. The language is excellent and the approach is very convincing. The examples are contemporary. At times his personal bias towards individuals, states and institutions is reflected but he accepts that. Overall reading these lectures has really benefitted me immensely to understand the basics of individual and group behavior in different social settings. I wish I had personally attended these lectures.